Arike Ogunbowale runs the fast break. Photo courtesy of Notre Dame Athletics. 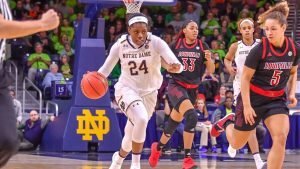 The 2018 NCAA Final Four was the Arike Ogunbowale show. In the semifinals, the Notre Dame star guard hit a last-second shot to send the powerhouse University of Connecticut home. Then in the National Championship game, she hit another last-second shot to win the title for the Irish. These shots, coupled with the fact that Ogunbowale led her team in scoring, must mean she was Notre Dame’s best player, right? The answer to this question depends on how you define “best.” When it comes to basketball, academic research, as detailed in the textbook Sports Economics, there is generally a disconnect between perceptions of performance and how a player’s performance impacts team wins. Let’s start with perceptions. Numerous academic studies tell us that perceptions of performance are driven by scoring totals. Players who score more points, even if that scoring isn’t particularly efficient, tend to be regarded as the “best” players. This is true in both studies of the NBA and the WNBA. We see it in how free agent salaries are determined, how minutes get allocated, who gets drafted, and who wins awards. This quote is also based on academic research. And that research indicates that players primarily impact wins by rebounding, forcing – and avoiding – turnovers, and shooting efficiently. Players who take many shots might score points. But if they don’t score efficiently and/or also do well with respect to rebounds and turnovers, they won’t produce many wins. As one can see, Ogunbowale was not the most productive player for Notre Dame in 2017-18. Of the team’s 33 wins produced (the team actually won 35 games), only 3.7 wins can be traced to the production of Ogunbowale. Meanwhile, Young, Mabrey, and Shepard combined to craft 19 wins for the Irish. Again, there is more to producing wins than shooting efficiently. That being said, just looking at this one statistic helps us see why Ogunbowale didn’t produce many wins in 2017-18. Relative to the team’s other top players, she simply didn’t shoot very well. Yes, she led the team in points, but because she didn’t score those points as efficiently as others, her wins production wasn’t as high. But despite these efficiency numbers, most Irish fans still consider Ogunbowale the team’s star. Top scorers who don’t score efficiently, such as Allen Iverson, Carmelo Anthony, and Donovan Mitchell in the NBA, are still considered “stars” by many basketball fans. From a statistical perspective, however, this doesn’t make much sense. No baseball or softball fan would think a hitter with a batting average of 0.200 was truly a great player simply because she/he had many at-bats. And no football fan would think a quarterback who only completed 40 percent of their passes as a great passer simply because they attempted many passes. But basketball fans will think a relatively poor shooter is great if that player takes enough shots to lead their team in scoring. The simple explanation for this is that most basketball fans don’t look at all statistics in evaluating a player. Most rely on what they see when they watch basketball, and that is usually the player who scores. Missed shots, turnovers, and even rebounds are simply not as memorable. Hence, perceptions of performance don’t always match how a player’s performance impacts team wins. There is good news for Ogunbowale fans. After 19 games in 2018-19, her effective field goal percentage is 51 percent. If she can keep this up until the end of the season, her final wins produced numbers will look much better than what we saw last season. Then the perceptions of Ogunbowale will finally come close to matching her production.